A few England players are seen celebrating as they get the Indians out with ease. After the match being washed out against Australia on the 26th of January,The Indian side had yet another chance to make it to the final of the Mid-Carlton series,but the Blue caps failed to grab this golden opportunity. M.S.Dhoni lost the toss and was put into bat first buy the opposition much like their previous encounter.Indian openers Shikhar Dhawan and Ajinkya Rahane gave India a much needed start,the platform was now set,the only thing left to do was for the middle order batsmen to come and consolidate this good beginning into into a big total,but they failed to do so.To everyone's surprise,in came Virat Kohli at No.3,though Dhoni had stated just the previous evening that he would continue to bat at No 4.Maybe this change took place as the team felt that Virat could turn this good start into a biggie,But alas things failed to work in their favor .Kohli fell to the trap of off-spinner Moen Ali, and his departure set off a collapse. A disappointed Virat Kohli walks back to the pavilion after scoring just 8 runs. Suresh Raina was again made a prey of an off-spinner when a big innings was expected from him.Mohammed Shami helped India score a decent total by playing a few shots of sure class which surprised everyone as it came from a bowler.The Highest runs for India were scored by Ajinkya Rahane(73) and the Blue's collapsed like skittles,struggling to put up a mere total of 200.If the team would have got the support from its middle order batsmen and added 40-50 runs more,the result may have been different. The 2nd half of the game was a bit of a relief for the Indians as their bowling department came to aid them.Stuart Binny's spell of 3-33 in 8 overs triggered India's hopes of winning.Having sent half of the England side back to the pavilion at 66,the Men In Blue had a ray of hope to win this one as the WACA ground at Perth is not an easy pitch to score on,but Jos Buttler and James Taylor came in the form of saviors to lead England to victory.India's fielding was not up to the mark,Rahane missed an easy run out and Raina dropped a crucial catch,both these could have help India inch closer to victory.Thus the match ended in Englan's favor and this win gave them another opportunity to face their arch-rivals on Sunday before they meet them in the opening match of the World Cup on Valentines day at the historic MCG Ground at Melbourne. The Defending Champions did not seem to have that zing and enthusiasm in them which a winning side/a side who wants to win has.Thier body language did not show good signs .Oflet the batting department has seemed to add to the worries of the Team as they aren't able to support their team when required the most and the bowling department has become this teams strength and helped them bring the match quite close.The Indian Team which is known for its excellent fielding too lacked to show their worth.With less than two weeks left for the World Cup to commence their seem more than many loop holes in the side at this moment.But it has been commendable how the Blue Caps have tried their best to defend their score and fought it till the end despite being a winless side in this series .Start Binny and Shikhar Dhawan proved themselves just in time before things went against them.Throught this tri series at some point or another it has been seen that the batsmen have become restless and thrown their wicket away by playing loose shots.This is one area we need to give importance to,Our bowling department has emerged stronger after this series. 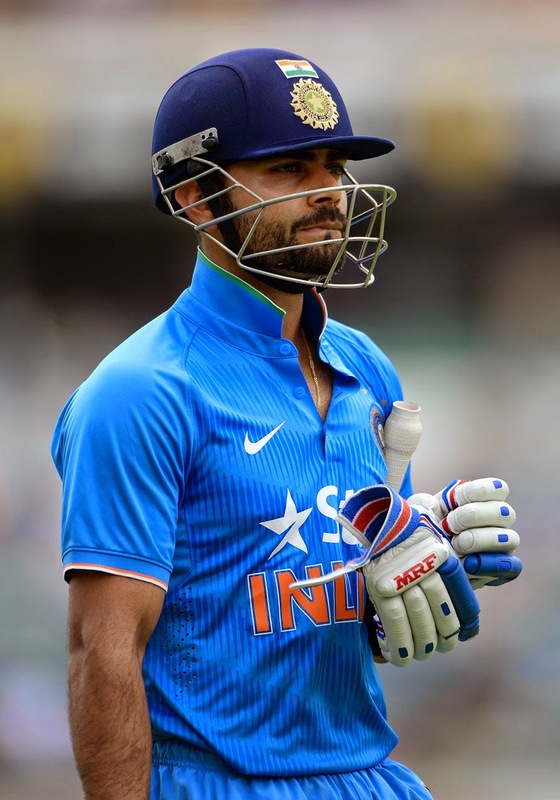 The best thing Team India could do now just as Skipper M.S.Dhoni said was to take a break. They should switch off themselves from Cricket,as it would make no sense to keep doing the same thing again and again in their practice sessions.They should rest and take it life easy for a week so that they can start afresh in the Warm-Up games Vs Australia on 8th February and Afghanistan on the 10th.This team is now well aware of the conditions as they have been playing on this soil since around 2 months,so the best thing to do at the moment is to cut-off from the game,before the big tournament awaits the defending champions. England create a World of problems for India in Perth.